Simple Grilled Asparagus Recipe – Ready in minutes! Asparagus is one of those vegetables we just love. When it is in season and therefore actually VERY affordable it becomes a part of many meals for us. Whether it’s a midweek quick BBQ dinner or a slow cookout on the smoker that takes a lot more time and we just want a simple side dish–we incorporate it often. Asparagus at it’s most basic only takes a few minutes to prep and cook. (Optional) Or instead of Kosher salt & Fresh ground pepper, we often use a nice Garlic seasoning rub with salt in it such as John Henry’s Mojave Rub. NOTE: Do not use both though as almost all rubs have salt and pepper already in them. After rinsing off asparagus, take asparagus spears and bend it near the bottom end so it “snaps” where it naturally wants to break near the bottom end of the asparagus (opposite of the spear shaped side). Take a cutting board or a casserole dish and place asparagus on it. 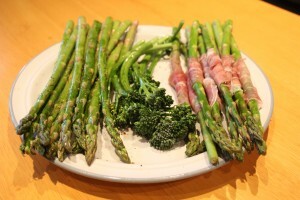 Drizzle the 2 teaspoons of olive oil over the asparagus and toss the asparagus to coat the spears. Sprinkle asparagus with small amount of salt & pepper OR a good light seasoning rub –do not do both. In general for one bunch of asparagus from the grocery store I will only use 1 tablespoon of barbecue rub–a lot gets stuck on the sides of the bowl as well. If using salt and pepper use significantly less, to taste, as to how you typically like your salt and pepper on any meal. Place on barbecue over direct medium to medium high heat. Note: If cooking other items that take awhile to cook, for timing, make sure you cook asparagus towards the end, or after you pull any dish off the BBQ that needs to rest for 5-10 minutes. Depending on BBQ temperature rotate after 2-3 minutes per side. Cook to desired level. We prefer ours Al Dente and usually cook only 6-7 minutes total.